Alejandro Garcia Moreno from Mexico City is a back-to-back World Championship competitor having earned his way there on Worlds Qualifying Points in 2017 and 2018. He’s also a 2-time UDS Invitational winner and a YCS Champion. It’s no overstatement to say that he is one of the greatest Duelists in Mexico. 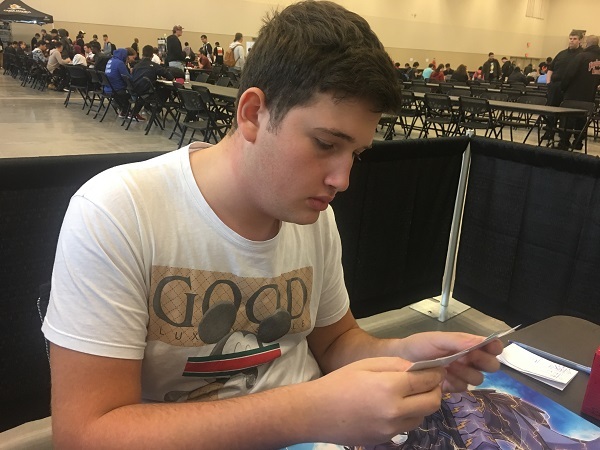 Now he’s here in Niagara Falls, looking for his second YCS win. 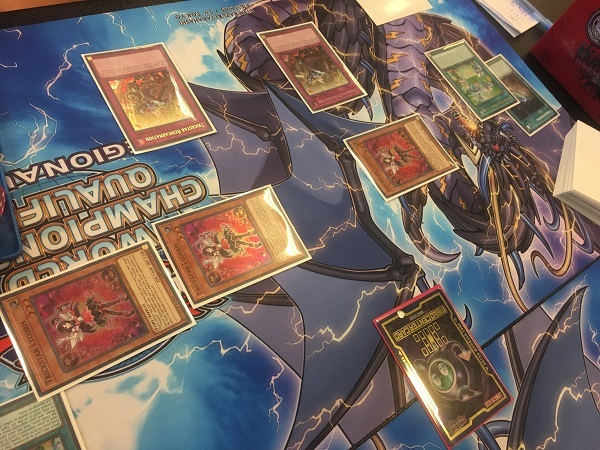 Garcia is using a Sky Striker Deck updated with Dinowrestler Pankratops, while his opponent, Luciano Greco from Toronto, Canada, is Dueling with a Trickstar Sky Striker Deck. Greco isn’t quite as accomplished as Garcia in the Dueling world, but he has been on a winning streak and is fresh off of a Top 16 finish from the 200th YCS in Columbus, Ohio last month. Will Greco’s recent Dueling momentum build into another Top Cut finish this weekend, or will Garcia defeat him in this Round 10 Feature Match to put an end to it. Both Duelists currently have a 6-2-1 record, so they’ll need a win here to have a shot at making the Top 32 cut. It’s time to Duel! Greco started off the Match by activating Trickstar Light Stage. He added Trickstar Lycoris to his hand, then used Terraforming to add another Light Stage to his hand. He activated it to add another Lycoris to his hand and then Normal Summoned Trickstar Candina. He used Candina’s effect to add Trickstar Reincarnation to his hand and then Set 2 cards to his back row. He used the effect of his Lycoris to Special Summon it by returning Candina to his hand, then Chained the effects of his 2 other Lycoris, Special Summoning all 3 to the field after returning Candina to his hand. Garcia opened up with Scapegoat,Sky Striker Maneuver – Jamming Waves!, Sky Striker Maneuver – Afterburners!, Sky Striker Mobilize – Engage!, and Called by the Grave. He drew Shared Ride for his turn and lost 1200 Life Points due to the effects of the 3 Lycoris and the Light Stage. In the Standby Phase, Greco activated Trickstar Reincarnation. He Chained another Reincarnation next. Garcia banished 6 cards, drew 6 cards, lost 4200 Life Points, and then banished his new 6 cards to draw 6 more and lose another 4200 Life Points. Suddenly, the Duel was over! 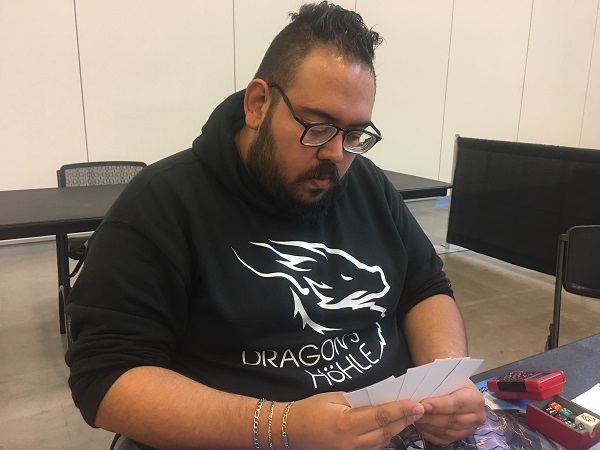 Just by drawing cards, Alejandro allowed Greco’s Trickstar cards to drop his Life Points down to 0! 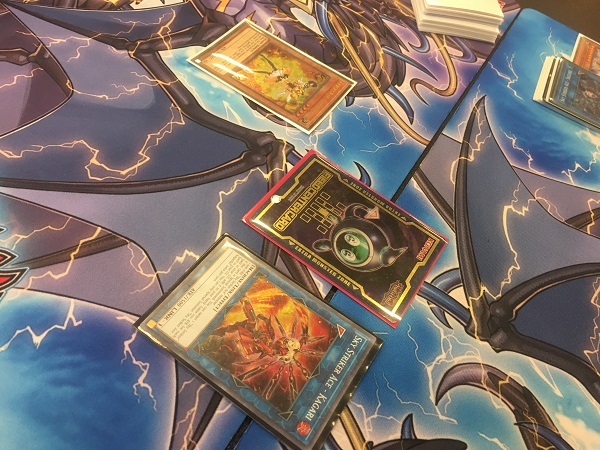 Garcia opened up Duel 2 with Called by the Grave, Foolish Burial Goods, Dinowrestler Pankratops, and 2 copies of Sky Striker Mecha – Widow Anchor. He activated Foolish Burial Goods to send Metalfoes Fusion from his Deck to his Graveyard and then used the effect of the Metalfoes Fusion to shuffle it into his Deck and draw a third Widow Anchor! He Set 2 Widow Anchors and passed his turn. Greco activated Terraforming to add Light Stage from his Deck to his hand and used its effect to add Trickstar Candina to his hand. He used Light Stage’s effect to target one of Garcia’s Widow Anchors and then activated Sky Striker Mobilize – Engage! to add Sky Striker Mecha – Hornet Drones from his Deck to his hand. He used Hornet Drones to Special Summon a Sky Striker Ace Token to the field and then used the Token to Link Summon Sky Striker Ace – Kagari. He used Kagari’s effect to return Engage to his hand and then Summoned Candina. He used Candina’s effect to add Trickstar Lycoris to his hand. He attacked directly with Kagari and Candina in the Battle Phase, dropping Garcia down to 4300 Life Points. Next, he used the effect of the Lycoris in his hand to Special Summon it by returning Candina to his hand, and attacked directly with Lycoris to drop Garcia down to 2500 Life Points. In Main Phase 2, Greco used Kagari to Link Summon Shizuku. In the End Phase, he activated Shizuku’s effect, and Garcia flipped over the Widow Anchor that was previously targeted by Light Stage to negate its effect. Garcia drew Terraforming. He Special Summoned Pankratops and attacked Lycoris with it, destroying Lycoris in battle. Next, he Tributed his Pankratops to try to destroy Greco’s face-down Called by the Grave, and Greco Chained it to banish Pankratops. Garcia activated Called by the Grave to banish Lycoris, and still in his Battle Phase, he flipped his face-down Widow Anchor to take control of Shizuku. He attacked directly with Shizuku and then used it as a Link Material to Summon Sky Striker Ace – Kagari. He used Kagari’s effect to return Widow Anchor to his hand and then activated Terraforming to add Sky Striker Airspace – Area Zero to his hand. He used Kagari as a Link Material to Summon Shizuku and then Set 2 cards to his back row. He tried using Shizuku’s effect in the End Phase, but lost out to Greco’s Ash Blossom & Joyous Spring. Greco used the effect of a Light Stage to target one of Garcia’s face-down Widow Anchors and then used Sky Striker Mobilize – Engage! to add a Widow Anchor from his Deck to his hand and draw a card. He activated Widow Anchor to negate the effect of Shizuku and take control of it, and when Garcia used his own Widow Anchor, Greco used another one to take the Shizuku. Greco used the Shizuku as a Link Material to Summon Kagari and then Normal Summoned Trickstar Candina! After using Candina’s effect, direct attacks from Candina and Kagari wiped out the rest of Garcia’s Life Points! Luciano Greco defeats Alejandro Garcia Moreno and finishes the Swiss Rounds with a 7-2-1 record!